The NFC Divisional playoff game on January 7, 1990 at Giants Stadium in the New Jersey Meadowlands featured the host Giants, champions of the NFC East with a 12-4 record, against the visiting Los Angeles Rams, second place finishers in the NFC West at 11-5. It was truly a contrast in styles. New York, coached by Bill Parcells, was a conservative club and most of its games in 1989 were close. The Giants had a sturdy defense that featured linebackers Lawrence Taylor and Carl Banks, DE Leonard Marshall, and CB Mark Collins. Injury-plagued QB Phil Simms guided the offense that benefited from the play of RB Ottis Anderson (1023 yards), who was 32 and hadn’t been anywhere near 1000 yards in a season in five years. But the loss of star TE Mark Bavaro to a midseason injury had been detrimental. Moreover, New York, after winning the Super Bowl following the ’86 season, had missed the playoffs in 1987 and ’88 and had trouble against playoff teams during the regular season, despite their impressive record. The Rams were coached by John Robinson and were as exciting and pass-oriented offensively as the Giants weren’t. 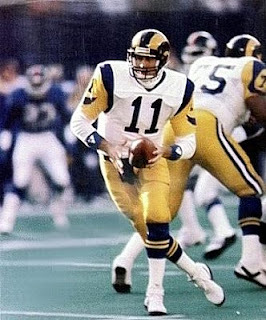 QB Jim Everett set a new team record with 4310 passing yards and had outstanding receivers to throw to in Henry Ellard (70 catches, 1382 yards) and Willie “Flipper” Anderson (44 catches, 1146 yards, a 26.0 average per reception). Los Angeles could run the ball, too, as RB Greg Bell gained 1137 yards and scored 15 touchdowns. However, while the defense boasted some stellar performers such as pass rushing LB Kevin Greene and CB Jerry Gray, it tended to give up far too many points. LA, after finishing behind the 49ers in the division, easily defeated the Eagles in wintry weather at Philadelphia in the Wild Card playoff game. There were 76,325 fans at Giants Stadium, and the home team largely dominated the first half. On the first LA possession, Lawrence Taylor, sacking Everett for the first of two times, forced a fumble at the New York 11 that LB Gary Reasons recovered. Placekicker Raul Allegre, who had just been activated after six games following an injury, kicked two field goals in the first quarter, of 35 and 41 yards. The Rams had trouble moving the ball on offense and defensively had difficulty containing Ottis Anderson (pictured below). However, the Giants couldn’t get into the end zone, allowing Los Angeles to stay in the game. Late in the second quarter, the second turnover of the game occurred when LA’s Jerry Gray tipped a Simms pass that was intercepted by safety Michael Stewart, who grabbed the ball near midfield and returned it 29 yards. On the next play, Everett threw a 20-yard touchdown pass to Willie Anderson that made the score 7-6 with 17 seconds left in the half. On the first drive of the second half, Everett was intercepted in the end zone by Collins. The ensuing New York drive ended in a punt, but Sean Landeta’s 49-yard kick was fielded by CB Darryl Henley for the Rams, who lost 11 yards trying to return it. LA had to punt it back, and the Giants proceeded to drive 82 yards in 14 plays capped by Ottis Anderson’s two-yard run for a TD with just under two minutes remaining in the third quarter. Anderson had six rushes for 28 yards on the drive while Simms completed passes of 11 yards to rookie RB Dave Meggett to the Rams’ 40 and to TE Zeke Mowatt for 23 yards to the nine yard line. New York was back in front by 13-7. The Rams responded with a 69-yard drive that led to a 31-yard Lansford field goal less than three minutes into the fourth quarter. Everett threw to Ellard for gains of 23 and 16 yards along the way, and Bell ran for 16 yards on a draw play. The Giants’ lead was narrowed to 13-10. The Rams drove to the tying field goal on a 75-yard possession in which Everett was successful on six of seven passes for 44 yards. The quarterback also had a 13-yard run to the New York 12. Lansford kicked a 22-yard field goal to tie the game with 3:01 left on the clock and send it into overtime. LA won the toss to gain first possession in the sudden death period. The Rams advanced from their 23 to the 48 on a 12-yard pass to TE Pete Holohan and 13-yard completion to Ellard. Giants CB Sheldon White then drew an interference call on Willie Anderson that resulted in a 27-yard advance into New York territory. On the next play, following a five-yard penalty for a false start, Anderson beat Collins for a 30-yard touchdown in the right corner of the end zone (pictured at top) and kept right on running into the tunnel leading to the locker rooms as the home crowd sat stunned. The contest went just 1:06 into overtime and was won by the Rams, 19-13. While the Giants had dominated the first half, overall Los Angeles ended up with more total yards (448 to 344) and first downs (26 to 20). The Rams gave up two turnovers, but after the two early sacks by Lawrence Taylor, Everett wasn’t thrown for a loss again. Jim Everett threw 44 passes and completed 25 of them for 315 yards with two touchdowns and an interception. Henry Ellard (pictured at left) caught 8 passes for 125 yards while “Flipper” Anderson scored on both of his two receptions that covered 50 yards. Greg Bell ran for 87 yards on 19 attempts. For the Giants, Ottis Anderson was the star with 120 rushing yards on 24 carries, including a TD. Phil Simms completed 14 of 29 passes for 180 yards and had one picked off. Dave Meggett caught four passes out of the backfield for 52 yards and Zeke Mowatt also gained 52 yards, on three receptions. “This game is more than one play,” concluded Bill Parcells. “I'm proud of my guys, they played their hearts out." 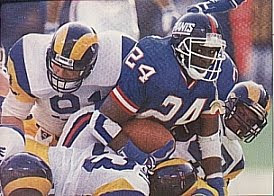 It was the third straight win on the east coast for the Rams, who won at New England in the season finale to clinch the wild card slot and then won at Philadelphia in the first round before coming to Giants Stadium. But while the Rams were glad to get another shot at the division-rival 49ers in the NFC Championship game, a club they had split with in the season series, it was San Francisco handily winning the conference title by a 30-3 score.